Sunday 20th January is Penguin Awareness Day. If penguin's were native to the northern hemisphere I'm sure we would all see a few this week !!! This lovely little fellow has been stamped with black Stazon onto acetate and then coloured with glitters using Art Institute glue. It takes a while as it's best to glue each colour separately but it's worth it in the end. Apply the glue to the back of your image so you can still see the stamped detail but you get a nice sparkly finish that stays smooth to the touch on the front. The window is a Heartfelt Creations die 'Decorative Window Scene'. I have drawn round the inside of the die with pencil and then cut out the opening to make my window. The card is coloured with Distress Inks, colours listed below, using a shaving brush to get a stippled effect. The small flowers are stamped in Distress Ink Rusty Hinge. The frame is cut from chocolate pearl card and backed with pale green. Once the front of the card was decorated I stuck the frame on to it with Cosmic Shimmer PVA glue. 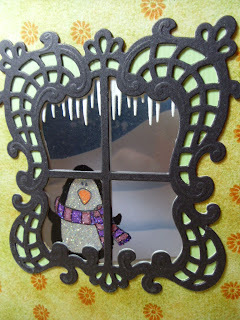 The acetate with the penguin on it has been stuck to the inside of the card using double sided strong tape. 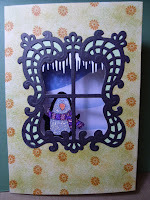 The icicles are cut with a Marianne Creatables die and stuck to the top of the window on the inside of the card. I have also cut another frame in plain white card and stuck that on the inside to tidy up where the acetate and icicles are attached. The background has been made on a separate piece of card that I then stuck to the back of the inside so it is visible through the window. I found it easier to do it this way, I didn't want to make a mistake on my card and have to re-make the whole thing. I cut a square large enough to fill the window opening plus a bit and then used Distress Ink Faded Jeans and a torn copy paper mask to make my sky and snow drifts. I haven't put a greeting on the card as I thought it could be used as a Thank You for Christmas or just as a note card to a friend somewhere out there in all this snow. Happy Crafting and stay warm. Distress Inks - Bundled Sage,Peeled Paint,Forest Moss,Wild Honey,Rusty Hinge,Faded Jeans.